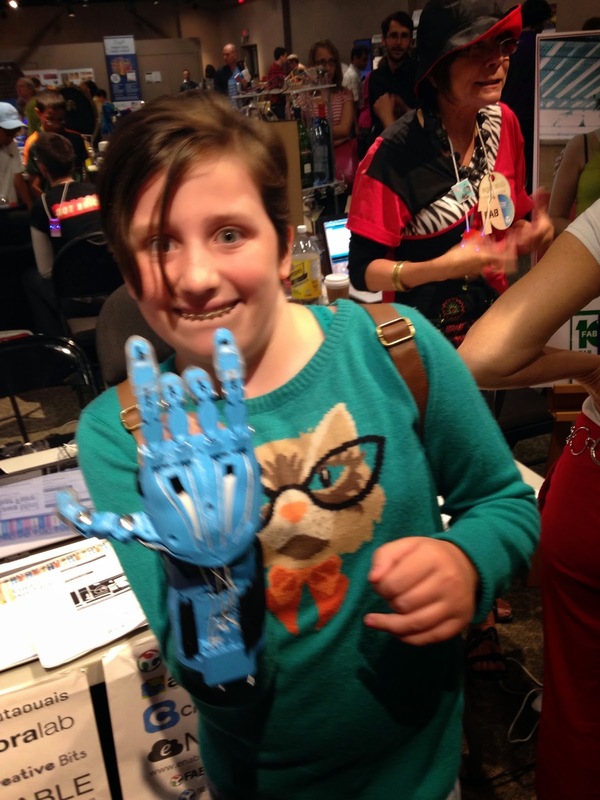 I had a great time exploring the Mini Maker Faire at the Museum of Science and Tech. I didn't get enough time to poke around, as I messed up and went to the wrong museum first. As a chronically late person, I was happy that I was actually early today and I had time to zip over to the Science Museum after confusedly showing up at the Aviation Museum. Not only did I get to participate in a panel, I got to see, first hand, how generous and exciting Ottawa's Maker community is. It had the same sort of frenetic feel of Comic Con, but I was even more excited to talk to exhibitors because of the educational implications. There is an incredible amount of cool stuff happening here in Ottawa. Some of it, like the OPL's Imagine Space and Maker Junior, I already knew about. So much more was new to me today, I got to try on the masks of an incredible artist named Ian Langohr; see Maker Creative's Skittlebot in action as it analyzed colours of Skittles to learn to create art; have custom hockey pucks created; speak to members of ecotonos, who incorporate nature, design and manufacturing; and see a chocolate 3D printer in action. I only wish that Hitchbot had been a guest today. I'm totally into that guy right now. I wish I'd learned what this was made with, but this beautiful sign, and many others around the museum were made out of styrofoam. The parking lot was jammed, yet I was still surprised by the huge crowds. I was so excited about this for Tiiu! Tiiu, my awesome teaching partner, has been experimenting with aquaponics through the end of last year and the summer. There have been numerous challenges, and I was excited about this 3Dponics system for her. 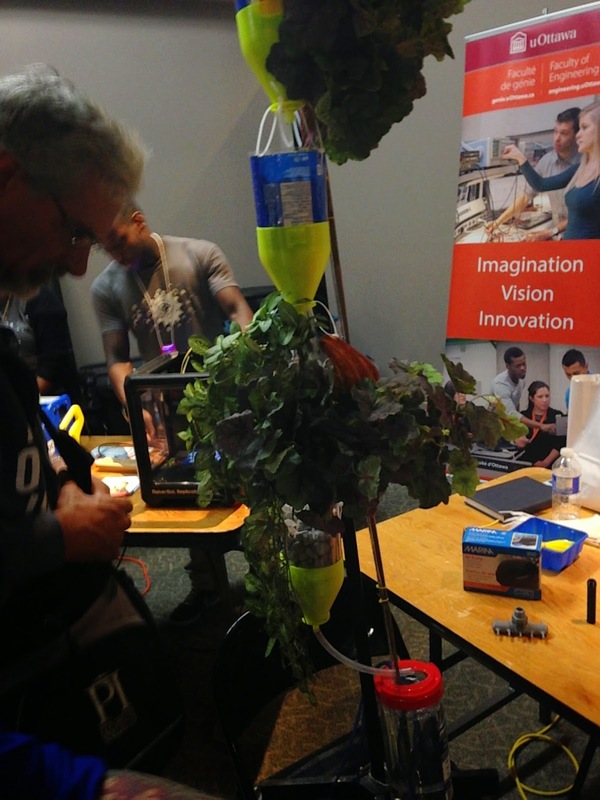 3Dponics combines hydroponics and 3D printing to create an open source hydroponics system with 3D printable components. The whole system, including a water pump and recycled bottles only costs about $20 to make. The creators said that they could do classroom visits and, despite being very intimidated by Tiiu's HUGE aquaponics system (including fish), I see this way of using hydroponics as very workable for a brown thumb like me. 3D printers have gone multi-coloured! There were a lot of 3D printers on display. This exhibit was unique, as they had a multi-colour printer and a chocolate printer! I think that a multicolour printer has potential, but as a colour nerd, I'm not happy with the colour choices yet. Talking to the gentlemen at this exhibit, they told me that my dream of a 3D printer that mixes colours and makes gradations is only 6 months away. I think I'll be much more aesthetically pleased at next year's Maker Faire. 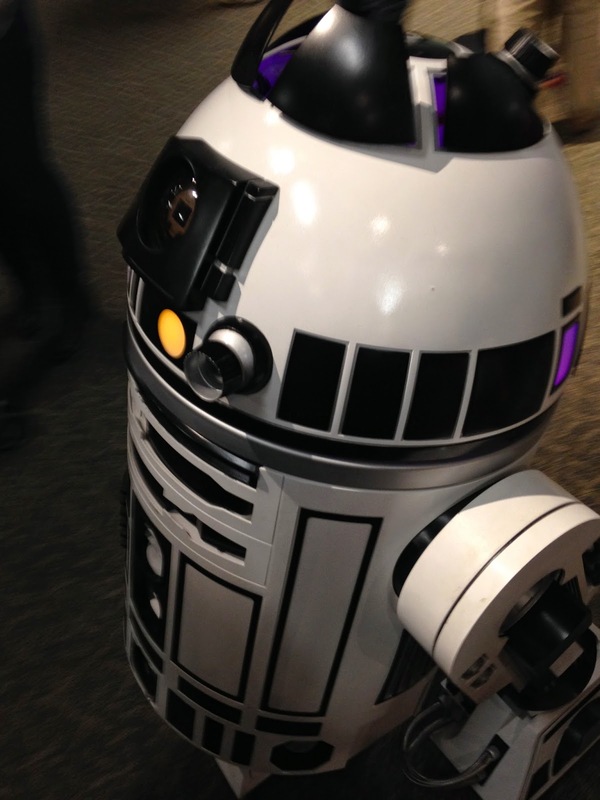 I almost couldn't leave the main exhibit room because of this R2-D2 in my way. It was awesome to have these little faces in the crowd during the panel. Even better to hear Skye's perspective on how tech helps to engage students and Gavin's perspective on how to get parents to buy in! I can't believe I didn't spot Pat in the crowd, but was thrilled to see him. What a team. These are my FOREVER (and EVER) students, even though they've graduated from my school! #skittlebot was very cool. 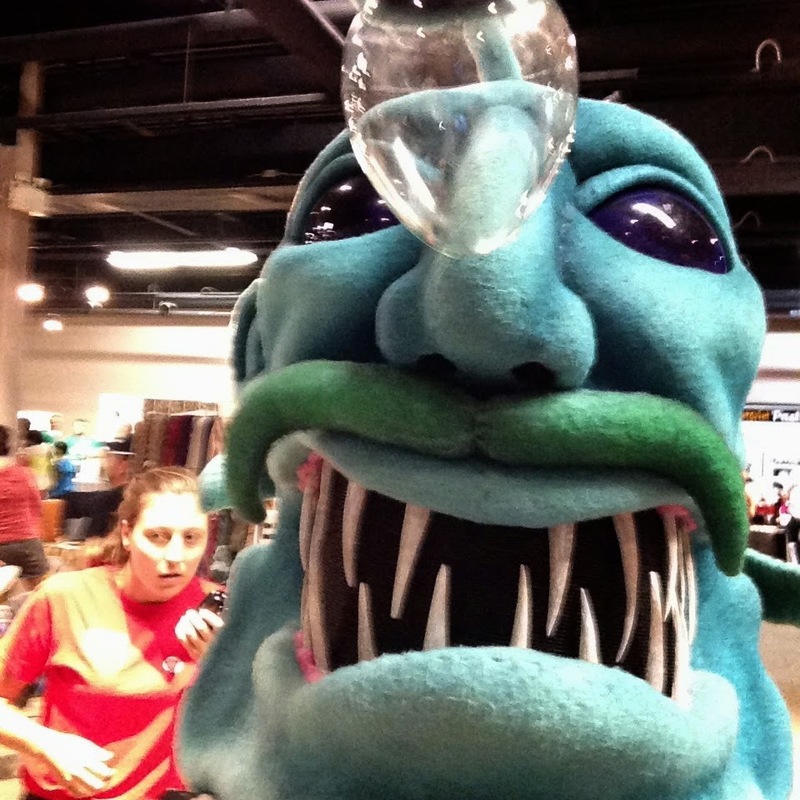 By posting this selfie, we have a chance at winning some Skittle art! How much do Fiona, Julianna and Skye look like triplets here? The girls were particularly excited to show me this 3D printed robotic hand that can be customized for people with different needs. This one is set up for a child missing their middle two fingers and is controlled by movements in your wrist. 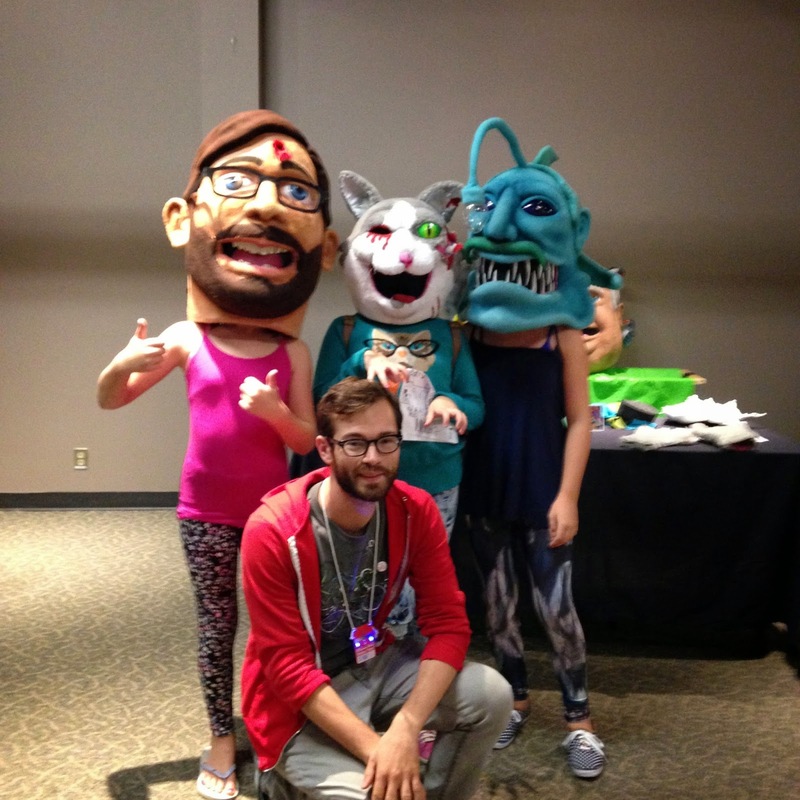 The most ridiculously awesome character masks I've ever seen. And they're not that heavy! Inside that one is me! I like the confused girl in the background. The cuties got some free custom pucks for a sick classmate and her sister, both awesome hockey players! I think that the Mini Maker Faire should be held during the school year and teachers be forced to attend. 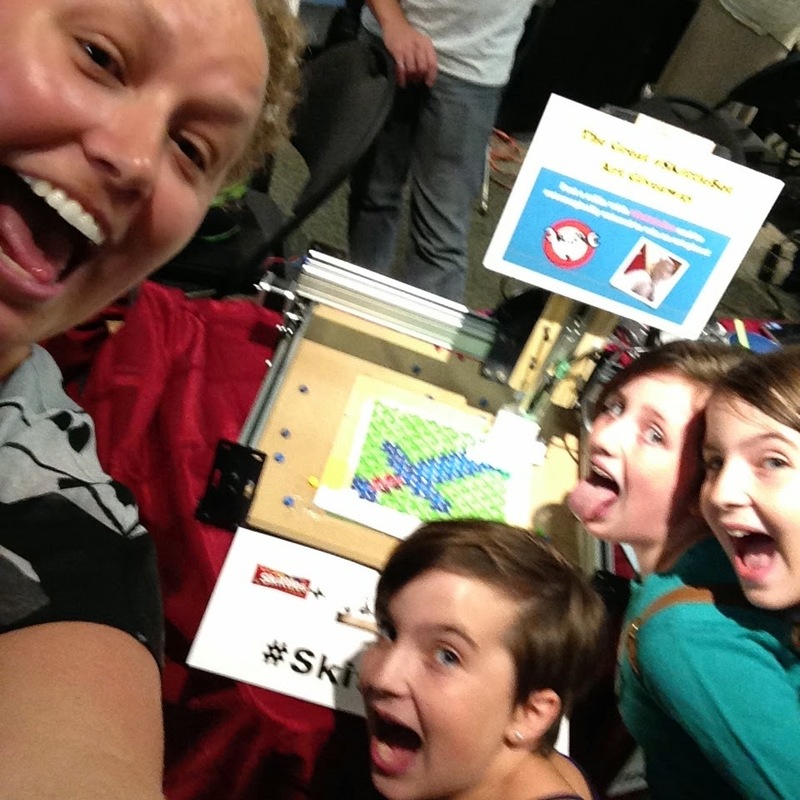 So many of the people there are already converts and totally into the maker movement already. An event like this would do wonderful things to convince apprehensive educators about the power and importance of making! In each of the makers I spoke with, I noticed pride and a sense of accomplishment. The novel ideas that they brought to life represented countless hours of questioning, building, testing and refining (and often, fundraising or crowdsourcing). I love that making is about mixing craft with technology in innovative ways. Makers are the blue sky, out of the box thinkers that I love to talk to. A former student who was taking me around after my panel told me that I'd have 1000 questions for all the makers and limited me to 3 per maker, as we were quickly running out of time. Bringing students to an event like this would surely excite and inspire far more than just telling them about it. I feel very fortunate that there is such a generous making community in Ottawa and look forward to bringing Luc and Alison back to my room and inviting new creators into my Experimental Prototype Classroom of Tomorrow (stay tuned for a blog post explaining the new name! ).